Belling are offering up to £150 cashback on new Farmhouse or Cookcentre Belling range cookers. Belling are offering up to £150 cashback on new Farmhouse or Cookcentre Belling range cookers. To qualify for this cashback promotion, the customer simply needs to purchase either a new Farmhouse or Cookcentre range cooker, and then provide purchase details online to www.bellingrewards.co.uk before the redemption close date of Sunday 30th June. The cashback comes in the form of a prepaid Belling MasterCard which, can be used for purchases made in store, online or over the telephone at any retailer that accepts MasterCard. Please note that the card cannot be used to withdraw money from an ATM. This promotion is only open to Residents in the United Kingdom ("UK"). Employees of GDHA (Glen Dimplex Home Appliances), its subsidiary companies, their families, agents and other parties directly involved with this promotion are not eligible to enter. The promotion is only open to participants purchasing for their own use (i.e. end users). Belling reserves, the right to verify the eligibility of Participants and/or exclude Participants at its sole discretion at any time for any reason. This promotion is only available through participating eligible Belling retailers in Great Britain, Northern Ireland, the Channel Islands, and the Isle of Man. To take advantage of this promotion, purchases must be made between 1st March 2019 and 31st May 2019 (inclusive). The cashback claim can only be made online through www.bellingrewards.co.uk. A maximum of one (1) qualifying product can be claimed per household during the promotion. The promotion is not available on any second hand, refurbished or reconditioned stock. Please note sales delivery notes, quotations and estimates are not proof of a sales purchase being made. Fully completed and correct claim submissions, together with a copy of the original proof of purchase must be received no later than 30th June 2019. Claims cannot be made online after this date and any claims not made online at www.bellingrewards.co.uk by 30th June 2019 will be deemed invalid and not eligible to receive the cashback. Each cashback claim is limited to a single use and cannot be used in conjunction with any other promotional voucher or cashback offer against the promotional product, as stated in Article 3.1. The customer’s proof of purchase must clearly show the Belling qualifying product purchased, the purchase price, the retailer where purchased and the date of purchase. 360Incentives.com, on behalf of Belling, will deliver the cashback via a Belling prepaid MasterCard, within 28 days of a consumer validating their claim by choosing a virtual or physical card redemption after their claim has been approved. The Belling prepaid MasterCard can be used for purchases made in store, online or over the telephone at any retailer that accepts MasterCard. Please note that the card cannot be used to withdraw money from an ATM. If you have any queries with regards to this promotion, please send an email to: bellingrewards@360incentives.com or contact our Claim Hotline on 0800 051 5780. Phone Lines are open from 9am-5pm, Monday to Friday. Calls are free when called from a landline but calls from mobiles may incur charges. Please check with your telephone provider for more details. The cashback claim form cannot be exchanged for cash. There is no cash alternative to this offer. Where the cashback payment constitutes a taxable benefit, the tax liability lies with the recipient. In the event that the customer returns the eligible promotional product to the seller/retailer, the participant will not be entitled to claim cashback and the claim will be thereafter dismissed. For the avoidance of doubt, this clause does not prohibit in any way the customer’s right to exercise their applicable statutory or warranty rights. The promoter is GDHA (Glen Dimplex Home Appliances) t/a Belling, Stoney Lane, Prescot, L35 2XW. The promoters reserve the right to withdraw the promotion at any time. Where applicable, any data captured during the course of the promotion will be collated, accessed, processed and stored wholly in accordance with applicable local data protection laws and regulations. Belling will not transmit data to unauthorised third parties or outside the EU. For full details on how we will treat your personal data, please visit: www.belling.co.uk/privacy-notice/. Upon registration, the participant will have provided their personal data to Belling, and 360Incentives.com, and to its agents, to carry out the promotion and to conduct marketing and quality control analysis. 360Incentives.com and its agents are responsible for securely storing, processing and transferring the participant’s personal data wholly in accordance with applicable local data protection laws and regulations. By registering, the participant consents to these terms & conditions. Should the participant tick the opt-in box on the online registration form, the participant also consents that the promoter, other 360Incentives.com entities and/or their agents can process their data for the purposes of advising participants of other promotions, new products and services, and/or future marketing and quality control analysis. Participants have the right to consult and request rectification of their information as held by the promoter. No responsibility will be accepted for claims lost, delayed or for those claims not received by the closing date. Claims will be disqualified if incomplete or illegible after midnight on 30th June 2019. It is the participant’s responsibility to ensure that sufficient details are provided for claims to be processed. Belling reserves the right to investigate and undertake all such action, as is reasonable, to protect itself against fraudulent or invalid claims including, without limitation, to require purchasers to provider further verification as to proof of purchase. In addition, Belling reserves the right to reject those claims which it considers, in its absolute discretion, are fraudulent or invalid. 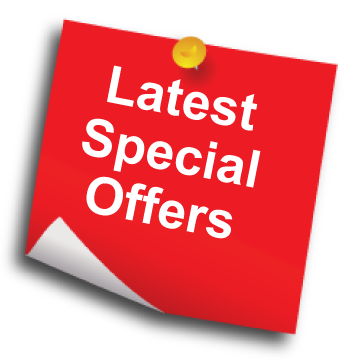 Belling is not liable for any costs incurred by the participant relating to the promotion. Belling shall not be liable for any delayed claims of any nature with regard to this promotion. However, nothing in these rules shall have the effect of excluding or restricting the customer’s liability for personal injury or death cause by the proven negligence of the customer. Belling shall not be liable for any failure to fulfil this offer where such failure is caused by any supervening circumstances amounting to force majeure (meaning: beyond Belling reasonable control) and/or events which, without the fault of either party, render performances impossible or incapable of satisfactory execution. Belling reserves the right to withdraw this promotion at any time and/or to unilaterally change the terms and conditions without incurring any liability. These terms and conditions are governed by and shall be construed in accordance with English law and come under the exclusive jurisdiction of the English courts. Product information "Belling 90DFT - 90cm Cook Centre Range Cooker"
The stylish and compact Belling Cookcentre gives you plenty of cooking capacity, its tall fanned oven offering an impressive 86 litre (net) capacity, with a second 58 litre (net)programmable fanned oven beneath a dedicated grill cavity with variable electric element. Both ovens are A-rated, and for ease of use the Cookcentre also has a user friendly three button touch control LED clock and programmer, enabling you to time meals to perfection. This dual fuel range has an easy-to-clean one piece seamless gas hob with 5 burners, including a wok burner and cast-iron pan supports. 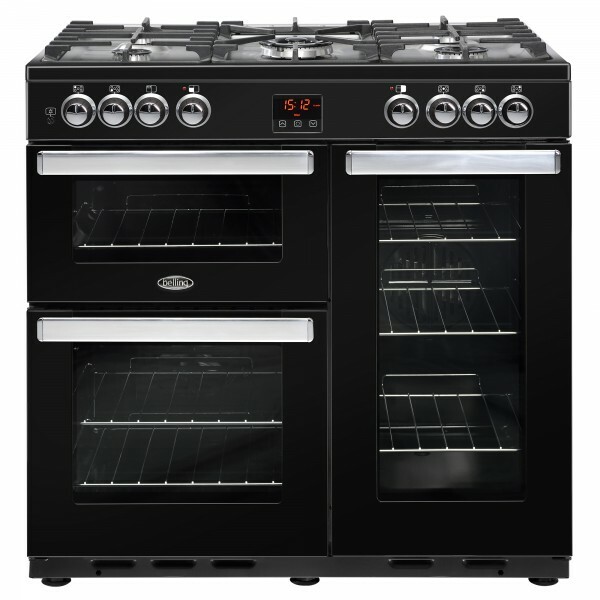 Belling are a familiar and family-oriented brand with a long history and a great reputation for producing cookers which offer exactly the right mix of style, quality and value. Made in Britain, Belling range cookers are built to a satisfyingly high standard, and have proved the right choice for generations of hungry families. Related links to "Belling 90DFT - 90cm Cook Centre Range Cooker"
Customer review for "Belling 90DFT - 90cm Cook Centre Range Cooker"